Deerfield Beach, Fla.—Summer is the season of patriotic holidays: Memorial Day, Independence Day, and Labor Day. At the same time, it’s the time of year that many people take the opportunity for home improvement projects in between barbecues and trips to the beach. With that, the team at Raskin Industries decided to help with a summer home remodel and lent a hand to one of our country’s brave servicemen. Earlier this year, Raskin connected with Gunnery Sergeant Jeffrey Boyer of the United States Marine Corps Forces Special Operations Command, better known as MARSOC, for a home renovation project. Boyer finds himself working on projects throughout the house when he’s not deployed (he recently returned from his fifth tour in the Middle East) and this summer saw the revitalizing of two main areas of the Boyer home: the dining room and the living room. He lives in Wilmington, N.C., with his wife, Lara, a personal trainer, and their six-year-old son Gunnar. 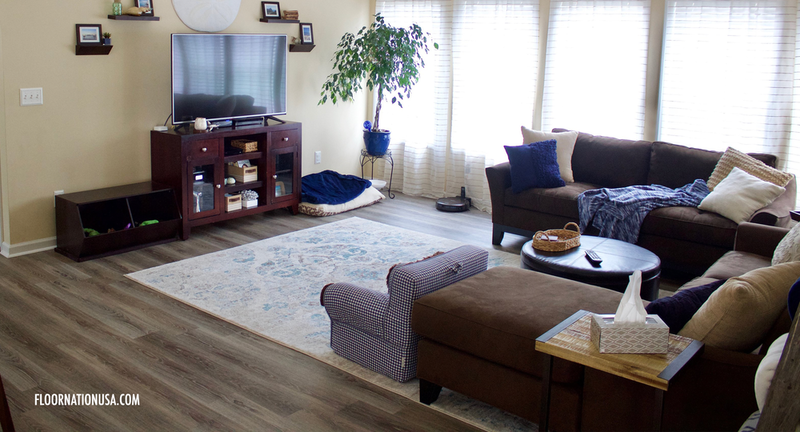 Reviewing Raskin’s extensive portfolio of luxury vinyl options, the Boyers landed on Pride from the FloorNation collection, a flooring line that is exclusively made in the USA. FloorNation is ideal for an active home as it comes standard with Raskin’s G88 ceramic coating system which delivers unparalleled stand resistance, and anti-bacterial and anti-fungal properties. Pride’s 20 mil wear layer and lifetime residential warranty mean nothing can stand in the way of maintaining its beautiful, natural-looking wood visuals. Local flooring contractor Carolina Commercial Floorcovering donated time and services to get the install in the Boyer home completed. Raskin connected with Dan Brock, Carolina Commercial president, who handed the project over to contractor Tim Dupree and installer Bryan Jones. For more information on FloorNation, visit raskinind.com/floornation. Always, and we mean always, look for the gorilla!